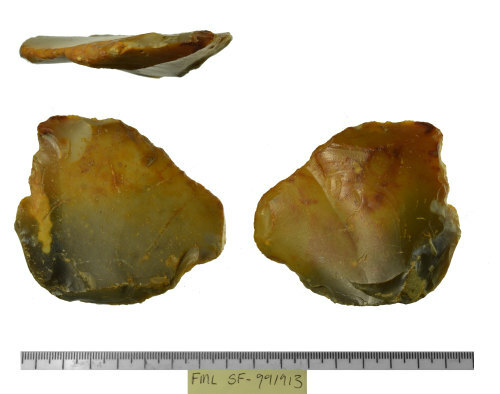 A ?complete flint implement of probable palaeolithic date. It is a large natural flake, roughly triangular in shape, but there appears to be a some irregular, short, abrupt retouch along two of the sides. This is very crude and as such the object is difficult to classify as a formal tool type. The majority of both faces is covered in an orange patina as a probable result of deposition in river gravels, suggesting a palaeolithic date, but one end has a milky grey patina probably from where it was in contact with a different type of deposit.